In the framework of the tour to Okinawa of the Seishinkan team, who carried out a tight schedule that ran from July 28 to August 23 and that included several activities among which the participation representing Chile in the “1st Okinawa Karate International Tournament” (Click here for further details) stands out, Karate and Kobudo seminars, visits to Tsuyoshi Uechi and Tokumura Kensho sensei and multiple trainings at Budokan and other places of historical relevance for Okinawan Karate. 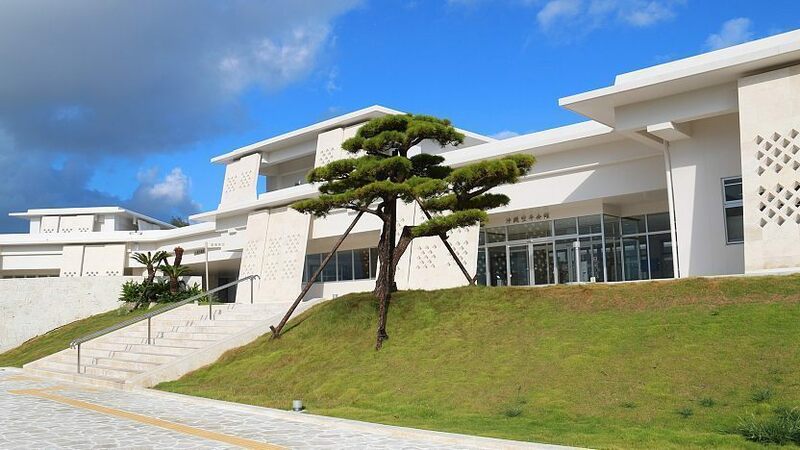 Some of the places chosen by the team led by Osvaldo Rodriguez sensei were the Okinawa Prefectural Hall of Martial Arts (Budokan) Arena and the historic Matsuyama Koen (Matsuyama Park), both located in Naha, the island’s capital. The latter is known worldwide for a place of tremendous historical relevance for Karate, because it is said to be the exact place in Okinawa where it was born, around the 19th century, what was known at the time as “Tudi” (唐手) or “Chinese Hand” (唐 character once used by the Japanese and Uchinanchu / Ryukyuans to refer to the Chinese and later replaced by “空” to, among other things, achieve that karate was accepted in good way in mainland Japan after the deep anti-Chinese feeling that reigned at the time). Trainings during visits to Kensho Tokumura sensei and Tsuyoshi Uechi sensei were completed and enriched a busy schedule of growth and future projects to help the growth of Okinawan Karate and Kobudo. Mauricio Lopez (Seishinkan Terraustral Montessory School), Alfonso Lavanchy (Seishinkan representative in Santiago, Chile) y Joaquin Alvares (Hombu Dojo, Chile), Seishinkan South America Students, were promoted to 1st dan in Tokushinryu Kobudo by Tokumura Kensho sensei, after a very concentrated training process that began in 2017 with the official incorporation of Seishinkan as representatives of Tokushinryu Kobudo in South America and the first official visit to the Hombu Dojo in Okinawa. In this opportunity, after several training sessions, our students were subjected to the exquisite and very critical eye of Tokumura Sensei who gave the great responsibility to these students, who now officially continue to enrich their path in budo through the practice of Tokushinryu Kobudo. Diego Rodriguez sensei (Seishinkan / WUIKA Europe), who after graduating of Yon dan in 2013 at the hombu dojo, officially started the last stage of an explosive growth process both in the personal area, moving to live in northern Europe, professional area, through of the development of his career as a Physical Education Teacher abroad, as well as at the organizational level, assuming the official role of representation in Europe of the Seishinkan organization. As a result of these efforts, relevant international cooperation projects have come to light mainly among the organizations Tokushinryu Kobudo & WUIKA Europe (World United Isshinryu Karate Association) led by Lars Andersen Sensei and Osvaldo Rodriguez Sensei, president of Seishinkan and representative of these organizations in South America. From 2014 to date, he has participated in several international events, giving seminars and competing in tournaments with the sole objective of showing, massifying and supporting the growth of Isshinryu and all its members in the region. On his last trip to Okinawa in August of this year and having finished his participation in the “1st Okinawa Karate International Tournament” (Click here for further details), he took part in the Isshinryu training series with Uechi Tsuyoshi sensei and Osvaldo sensei at the Okinawa Prefectural Hall of Martial Arts (Budokan) Arena. After intense and long sessions held on consecutive days, Diego sensei is a graduate of 5th dan, Renshi Go, in Okinawa Isshinryu Karate, closing with this a very significant stage, full of growth and starting a new one with perspectives and challenges for our organization at the international level. With these rank promotions, we conclude a very demanding tour in every sense, plenty of growth and deeply significant for all those who were part and could share, train and experience one of the most particular cultures in the world that also has one of its greatest cultural assets , the Okinawan Karate. During the nearly 31 years of existence of Seishinkan Budo School, this is characterized by the constant search and development of deep sense and practical applications to what develops day by day in our dojos. Understanding the origin, therefore, of those arts practiced more than 700 years ago is a relevant part of the integral training delivered by our organization to all our students. That is the reason for being that partially justifies the joint efforts of students and directors in different parts of the world to carry out ambitious projects, constantly oriented to the practice and technical, spiritual and historical development. In this line and with the constant intention of carrying out our Institutional Mission of “Constantly nourish our students with different knowledge regarding the practice of karate, orienting them to the maximum technical and theoretical development…“, We consider relevant in this opportunity to make a section with a brief historical review of what is considered one of the most emblematic places in cultural terms of what was once the Kingdom of Ryukyu and the result that had a long historical exchange history with the neighboring country China and particularly with the Fujian province. Everything goes back the old Ryukyu Kingdom Period (1392-1879) the majority of Okinawa’s Chinese community resided in Naha’s Kumemura district. Shortly after the establishment of tributary trade relations with China, a group of Chinese from Fujian were granted to Ryūkyū by the Chinese Emperor and started to immigrate to Okinawa in 1392. They came to be known as the people from the ‘36 Clans of the Min-People’ (minren sanshiliu-xing 閩人三十六姓). Min 閩 refers to the lower valley of the Min River in Fujian 福建 Province, China. They settled in a small Chinese colony in Kume village 久米村. In those days there was a magnificent park (now known as Matsuyama Koen) located between Naminoue Beach and what is now Fukushu Garden in Naha (福州園). Much of the Chinese community gathered there to enjoy various cultural activities, including martial arts, throughout the year. With much of these people coming directly from Fujian Province it’s not surprising to learn that most of the Quanfa/Kung Fu (拳法) was southern-style, and largely Fujian-based. The style practiced was White Crane, one of the five Fujian Southerm Chaolin Boxing traditions, with very particular movements that maintained a balance between the softness and hardness. As this specific Quanfa was not native to Okinawa, local Chinese learned, practised and taught what had been handed down within their family or community for generations. Experts who traveled between China and Okinawa, periodically influenced local sources and existing practices by visiting military officials, posted to Shuri Castle and the Chinese Embassy, ​​body guards and security personnel, all served to inspire local Chinese enthusiasts over time. In 1979, the Ryukyu Kingdom’s abolition took place and with it the return to its province of all the Chinese experts and bureaucrats posted for years in the place. With the annexation of these territories to mainland Japan, anti-Chinese sentiment arrived and began to grow, not being an impediment for generations of Okinawans to continue with the idea / tradition of meeting in this place to continue practicing the Quanfa that had been taught to them and experiment with different practices with the intention of improving the understanding of it. In spite of persisting even a strong Chinese influence in what until then was practiced, gradually began to take place a unique and particular approach that directly attaches to the culture of the Uchinanchu in those moments. The first signs of some katas practiced up to our days, traversed from generation to generation but still maintaining the roots in the practices carried out during this period, can be traced back to these years. Among the enthusiasts who gathered at Matsuyama Koen stand out among many the names of Aragaki Seishō 新垣世璋 (1840–1918), Sakiyama Kitoku (1830-1914) and Higaona Kanryo 東恩納寛量. The latter is the one who in September of 1870 and with the help of Yoshimura Udun Chomei (Aji or prince), manages to get permission to embark on the trip to Fuzhou on the pretext of going as an official translator of Okinawan bureaucracies and thus initiating the path that would lead him to be recognized until today as one of the first students of Fujian White Crane Kung Fu under the tutelage of the master Ryu Ryu Ko ルールーコウ (1873 – 1915)(“The History of Karate” by Morio Higaona). It should be noted that to this day there is a mantle of doubts that maintains no consensus among the men in Okinawa, about the true identity of Kanryo’s teacher. One of the evidences that supports these doubts is a monument outside the Fuzhou Gymnasium recorded that Ryu Ryu Ko, Kanryo’s Master, was a Crying Crane Kung Fu (whose main characteristic was deep breathing using the diaphragm to vocalize) grand master called Xie Chon Gxiang. In the words of Morio Higgaona sensei who was told that “Ryu Ryu Ko was a guard around 40 years old, tall, with powerful foot movements. Because of civil wars he went to many places and learned Crying Kung Fu. In the past, learning martial arts had to be covertly, which explains why his identity is a mystery today, we’ll never know exactly”. Back in Matsuyama nowadays, vestiges connecting this story with Okinawa can still be found. Just in front of the park is the Fukushu-en Garden (or Chinese garden) and in the park itself there are monuments in honor of Higaona Kanryo 東恩納寛量, Miyagi Chogun 宮城 長順 (1988-1953) and in honor of the place where the town of Kuma village was born. At present, many activities have been carried out to commemorate the historic good relations between both peoples. In November 2017, on the occasion of commemorating the 20th anniversary of the “Friendly Province” treaty signed between Okinawa Prefecture and Fujian Province of China in 1997, Okinawa sent a delegation led by the governor of 73 people, including many karate masters, for a series of visits and receptions between 9 and 13 of that month. 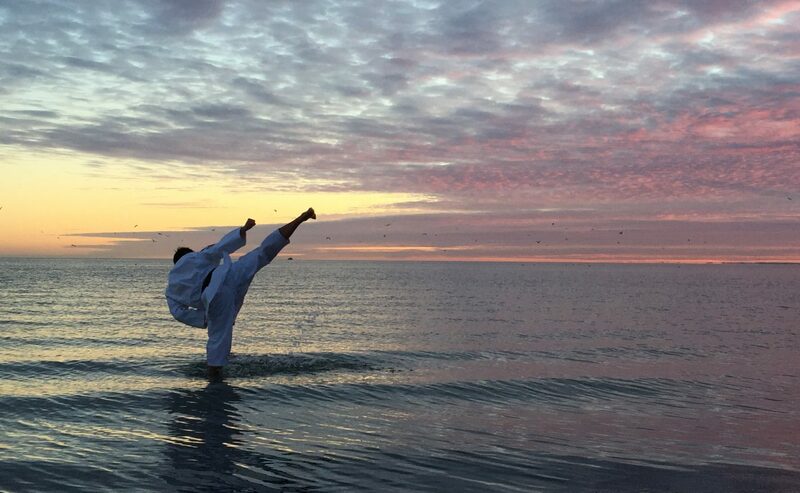 After the “2016 OIKKA World Karate Championship, Allentown, New Jersey” (check the article here), Diego Sensei moved and settled definitively in Northern Europe, where he successfully carried out the work of representing Seishinkan, establishing connections, contributing to the growth of Isshinryu and initiating his training in Tokushinryu Kobudo of Master Kensho Tokumura in the organization led in europe by Sensei Lars Andersen. As a result of this joint effort between the WUIKA organizations in Europe and South America, activities such as the past “WORLD UNITED ISSHINRYU KARATE ASSOCIATION & TOKUSHINRYU KOBUDO EUROPE TOUR – ROMANIA 2017” (check the article here) have been developed, and this August 2018, after their participation together to the team at the 1st Okinawa World Championship, Diego sensei will be visiting the Seishinkan Hombu Dojo in Chile to conduct a seminar whose main objective will be to review the basic principles of Okinawan Karate and Kobudo, with a new perspective that goes in support of the work of growth and consolidation carried out by the directors of WUIKA South America & Seishinkan in the region. This activity is presented as a prelude to the great event called “1st TOKUSHINRYU & WUIKA EUROPE SOUTH AMERICA TOUR – CHILE 2018 – 2019″ (click here for further info) scheduled for the end of this year and that will include a new visit of Diego sensei with two students of WUIKA Europe, who during a month, will be part of a series of trainings and seminars carried out in different dojos of the organization in the country. Basic technical principles: stances, attacks, blocks. Chinkuchi (チンクチ), Gamaku, Meotode/Mefutode (夫 妻 手). Isshinryu Karate & Kobudo Kata. Seishinkan Budo School & WUIKA’s board of directors hopes that with the realization of this event as a prelude to the end of year tour, our students and all the Okinawan Karate & Kobudo enthusiasts can gather, build connections and deepen their knowledge together with expanding horizons regarding the practice and development of this art in its purest and most traditional form. We are looking forward to meeting you all during this coming events. 31st Shingo Ryu Cup, Næstved Denmark 2018. Okinawan Karate Nordic Seminar, Stockholm Sweden 2018. Tokushinryu Europe Winter Camp & 2nd Tokushinryu Cup. World United Isshinryu Karate Association & Tokushinryu Kobudo Europe Tour – Romania 2017. 31st SHINGORYU CUP – NÆSTVED, DENMARK. A wonderful climate and an always peaceful city, it was the perfect setting for the realization of the 31st version of the traditional Shingoryu Cup, carried out at the Arena Næstved in Denmark, last Saturday, May 5, 2018. With an organization that has already accustomed us to a very good logistics deployment and excellent organization, the event had a framework of assistance that bordered the 200 competitors belonging to the 31 karate clubs coming mainly from Denmark, Romania and Sweden. It should be noted that the Shingo Ryu Cup, is an open karate event for all styles, so the categories of kata are quite attractive and varied in terms of technique and principles of each style. This year, stand out among the participating styles, Kyokushin, Oyama Ryu, Ashihara, Goju Ryu IOGKF, Shotokan and Isshinryu, being these last two those who reigned the podium this 2018. After three previous rounds, the final of the category was disputed between a competitor belonging to the Shotokan style, who made a wonderful presentation after which, Diego sensei performed the Kusanku kata, in a version with competitive timing but maintaining the bases of Isshinryu. In this way and by unanimous decision of the judges, the representative of Seishinkan and Isshinryu is crowned champion for the second year in a row with a splendid performance. 3rd Place: Florin Bodeneu Constantin, Isshinryu Toratoshi. Romania. This event also turned out to be a wonderful opportunity to reunite the Isshinryu family in Europe, as it brought together the various schools, clubs and practitioners from Romania, Denmark and Sweden who, in turn, represented WUIKA and Isshinryu in a very good way. Seishinkan participates in the acknowledgements for the effort and support of WUIKA Europe through its representatives who were supportive throughout the event. A sensei Lars Andersen, Mads Nørby and Martin Frederiksen. We extend a cordial greeting and thanks to the organization of the 31st edition of the Shingoryu Cup waiting to see you again in 2019. Last March, the event called “1st Okinawan Karate Nordic Seminar, in the footsteps of Grand Master Chotoku Kyan” took place in the city of Stockholm, Sweden, which as its name suggests, seeks to bring together the most representative styles that derived from the teachings of master Chotoku Kyan. Such styles are currently: Isshinryu, founded by Shimabuku Tatsuo sensei (1908-1975), Shorinji Ryu, founded by Nakazato Joen sensei (1922-2010) and Shorin Ryu, founded by Shimabukuro Zenryo sensei (1908-1969). The event, held for the first time in Scandinavia, was organized by the school Shorinjiryu Sweden, led by Robert Iversen Sensei and had representatives from Finland, Sweden and the special participation of Diego Rodriguez Sensei from Chile, who is currently based in the capital of Sweden. Robert Iversen Sensei, Okinawa Shorinji Ryu Sweden, 7th dan. Diego Rodriguez Sensei, Okinawa Isshinryu Seishinkan Sweden, 5th dan. The overall balance of the activity was positive on the part of the instructors and participants who valued instances like these to develop greater perspectives of Okinawan karate and enrich their training process in each style. Participants from other styles of karate such as Shotokan rated the instance as a great opportunity to learn more about the origins of their style and discover similar principles and techniques in Okinawan roots. The event is planned to take place annually and rotationally in the different Scandinavian countries, with the following meeting being scheduled for 2019 in Helsinki, Finland, and organized at that time by Kim Mitrunen sensei and the Shorin Ryu school of that country. Seishinkan Budo Europe and the community of Isshinryu in the region highlight, support and appreciate the initiative to create a common space for the practice, development and promotion of Okinawan karate and Kobudo with an integrating perspective and in search of the universal principles that characterize the martial art practiced by thousands of people around the world. Pictures courtesy of Lasse Centervik & Shorin Ryu Seibukan Finland.